Explanation: What has the Curiosity rover come across on Mars? Dubbed Mount Remarkable, the rolling robot has chanced upon this notable 5-metre tall mound during its continuing journey around and, eventually, up 5.5-kilometre high Mt. Sharp. Unsure of the density of the surrounding layered sandstone, the human team on Earth has instructed the car-sized rover on Mars to drill into a rock on the side of Mt. Remarkable to investigate. Quite possibly, water involved in creating the dense sandstone could have helped to support ancient life on the red planet. Mt. 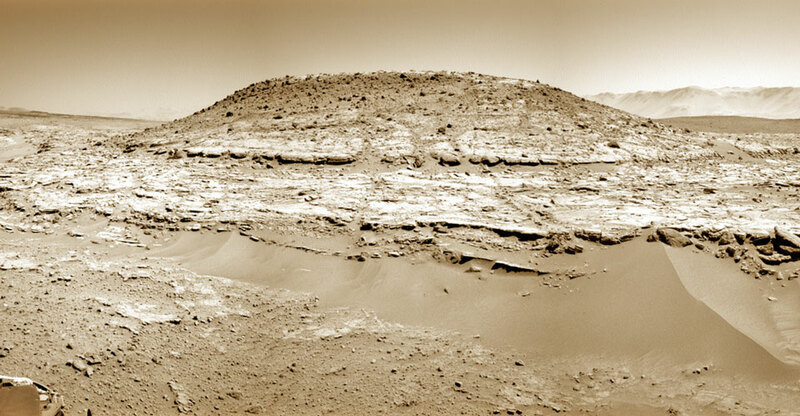 Sharp, the unusual central peak of Gale Crater, has a similar base-to-peak height as Earth's Mt. Everest.